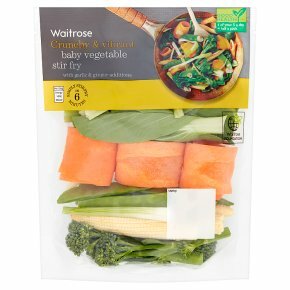 INGREDIENTS: pak choi, tenderstem® broccoli, carrot, babycorn, peas, salad onions, garlic, ginger. 6-7 minutes ……Remove all packaging …Pre heat wok or frying pan over a high heat. …Add 5ml of oil. …Reduce heat. …Add Tenderstem® broccoli and cook for 3-4 minutes, stirring continuously. …Add all other ingredients and cook for a further 3 minutes, stirring continuously. …Season to taste. Serve immediately.